I never felt that Stoke were a threat last weekend, partly because they have a terrible record against us at the Emirates, but mostly because they were without two of their best players in Affelay & Adam, whilst Bojan still doesn’t seem to have recovered from his injury last year and didn’t start the game. That said we still had to score against them, and we have had trouble scoring at home recently, so it was good to bag a couple of goals and also play quite well in the process. After dominating the early stages but failing to score I was a little worried that we had a frustrating afternoon on the way, but we slowly allowed them out of their own half and encouraged them forward, which in turn left space for Theo and Alexis to exploit. Our first goal came about as a result, with Coquelin winning the ball as Stoke looked to attack, (with a crowd pleasing tackle) before passing to Özil. As Stoke had pushed up and out from the back he had the option of giving Theo a ball to chase, which we don’t see too often at the Emirates as teams tend to sit deep. Theo finished very well and is making a very good case for himself as a centre forward. For me this game was made for Walcott’s strengths and I felt that Zagreb would be similar. Whether Arsene decided to play Giroud in order to save Theo for Chelsea is something we’ll find out very soon. Arsene made a lot of changes for the game and I don’t think anyone can blame him with Chelsea next up. He needs his full backs fresh for the challenges that will be posed by Hazard and Oscar/Ramires so I understand swapping Monreal & Bellerin for Gibbs and Debuchy. Both are good players who should have been capable of dealing with whatever Zagreb threw at them, but neither had enough help from their midfielders and Gibbs was altogether awful. I was hoping for a great performance from him as the injury to Luke Shaw could give him a good chance of going to the Euros this summer but he still makes the same basic errors that cost us whenever he plays. I don’t think many people would argue with me when I say that Giroud’s first yellow was stupid on his part, and his second was harsh on the referees. In almost every other similar situation he would have been given one more chance, but it was a yellow card tackle, it was reckless and it was miles away from the ball. What may have bothered Giroud even more than his sending off was seeing the team playing better without him. That kind of thing saps your confidence and a striker without confidence is not going to have a good game. He receives more criticism than he deserves, especially when you compare his goal scoring record with Rooney’s for example. He does miss a lot of chances but at least he’s there to miss them. Personally I rate him and I’ve no doubt he’ll be an important player for us this season. I’m reluctant to condemn a player starting his first game for months based on one bad performance. Arteta is not known for his pace and so why Wenger opted to start him instead of using Ramsey (who was left at home) or Coquelin is something of a mystery. Perhaps he felt that Mikel’s ability to control a game would render his lack of pace redundant. Perhaps he’s looked very good in training recently. 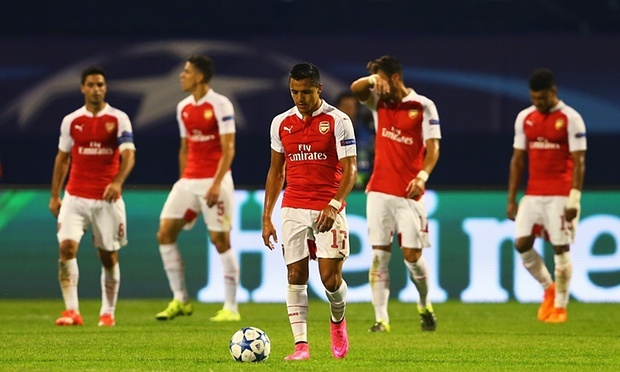 Perhaps Wenger simply underestimated Zagreb. No matter what the reasons are I feel that Arteta is still a quality squad player and can do a job for us this season, though maybe not away from home in the champions league against a team full of pace. Jose will have been pleased to hear that we played roughly an hour with 10 men and were forced to bring on players Wenger clearly wanted to rest, but that won’t have changed his plans too much. He’s got some big decisions on his hands over who to start given Chelsea’s terrible form so far this season. Does he recall Terry and risk his lack of pace being exposed? Does he stand by Ivanovic? (Unlikely). Does he start with Ramires on the right and try to contain Alexis? For our part we can expect the returns of Monreal, Bellerin, Coquelin and Ramsey, whilst Theo is likely to start given his mere presence pushes most defences 10 yards further back. Wenger has a decision to make regarding Mertesacker and Gabriel, (who has been playing very well). Per might be a little rusty and short of match fitness so Chelsea at Stamford Bridge is probably not the best game to come back into, but if Arsene has no problem throwing Arteta straight into an away game in the Champions a League he won’t be too worried about an away trip to the current champions. Getting a point there would be a good result. Getting a win would be a great result, and given their current league form I don’t think we’ve had a better chance to win there in years. Exclusive Nicolo Barella Scouting Interview with Matthew Santangelo – The Perfect Ramsey Replacement? Is Mike Dean to blame for a Decade without a Title or is Arsene?